Like a lot of Facebook features, Live Location is being rolled out as a silent update, so you may not get access immediately. When it does become available though, it's relatively easy to invoke from any conversation in the app. In a chat, begin by tapping the arrow-shaped Location icon —if it's visible —or else on the triple-dot More button, then on Location. This should bring up two options: sharing a fixed location by tapping on a red pin, or Live Location by hitting a big blue bar. 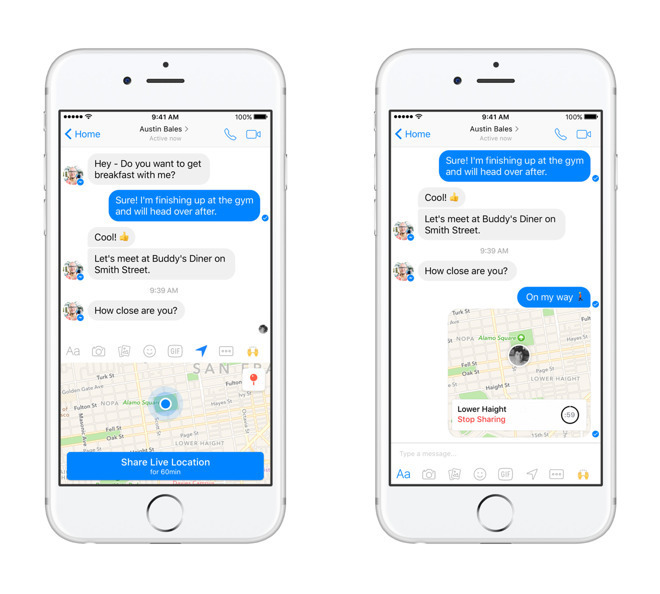 Be warned that Messenger may ask for permission to track your location in the background to make the feature work. Once live sharing is active, the other person will see a map appear in chat, along with a 60-minute countdown until tracking stops. They'll also see an ETA for car travel, which may be useful in figuring out how quickly a family member will get home, say, or whether or not there's time to make it to a movie. On the sharing side, tracking can be ended early by tapping a large white Stop Sharing button, whether in the chat map or by repeating the steps above.